Today I got back to the Art Gallery of Alberta. My first motivation was to re-visit the Emily Carr exhibit. My second reason was a visit to the new exhibition of abstract paintings by Lawren Harris, renowned landscape painter with the Canadian Group of Seven. Lawren Harris was a founding member of the Canadian landscape school but even in some of his later landscape paintings the move to abstraction was very apparent. This exhibit, simply and appropriately called Lawren Harris Abstractions, focuses solely on the abstract works later in Harris’ career. The core of this relatively small exhibit are six paintings from the Art Gallery of Alberta’s own collection. Supplementing those works are sixteen from the National Gallery of Canada. Probably half of the works are large (a meter or two) paintings and very interestingly there are a number of abstract sketches, some apparently preparatory sketches for the works on canvas. There is a certain spirituality to Harris abstracts relating to Harris’s following of Theosophy. I really enjoyed these Harris works and spent some time studying the curves, colors, shapes, volumes and composition. They are interesting from across the room and intriguing up close. The Harris exhibit runs through to September 11, 2011. For more about Harris and his abstracts check out this CBC story from 1961. The other exhibit I had an opportunity to visit today was Nature and Spirit: Emily Carr’s Coastal Landscapes. I had seen this exhibit a few weeks ago and at the time vowed to visit again. It was just as impressive this time as it was the first time. I focused just on Carr’s paintings today foregoing the companion exhibit of Canadian west coast native art and artifacts. For more on my first visit see my earlier blog post. The Carr exhibit runs until 2011 June 5 and I will get back, at least one more time. In an earlier post I pointed readers to some of my favorite snow paintings by the Canadian Group of Seven. I did not include there any of the paintings by the not-quite-a-Group-of-Seven-member Tom Thomson. You might say I was saving the best for last. Tom Thomson is my favorite and certainly was a master of the rugged Canadian landscape in all seasons. 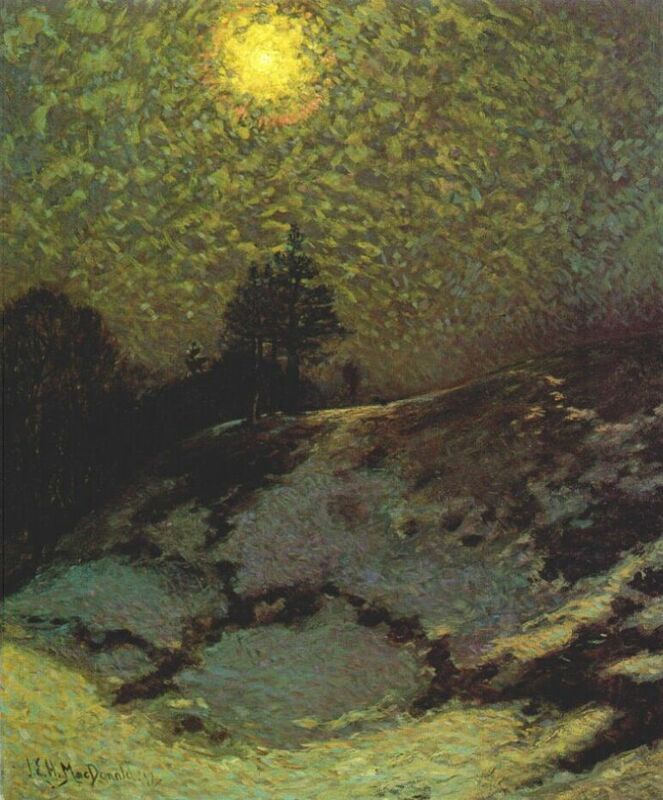 Although he would typically spend his winters working in his studio in Toronto, Thomson certainly encountered and painted snow and ice in the early spring and late fall. As I had done with the Group of Seven snow paintings, I studied prints of Thomson’s works to better understand the values he used for snow and the relative difference between snow in the sun versus in the shade. I used my value scale comparator with a value 1 being associated with pure white and a 9 for black. I observed a fair bit of variation in Thomson’s paintings with snow in sun appearing to be anywhere from a 2 to a 5 but 3 was the most common sunny snow value. When the snow was in the shade the value usually dipped a couple of points. Although not scientific, with my eye I estimated the shady snow in Thomson’s paintings to rand from 5 to 8 with 5.5 being the most common. First Snow in Autumn is a very snowy painting with clear areas in sun and shade. By my estimate this one of the highest values for sunlit snow. The almost white color I would estimate to be a value 2 while the light blue shadows are about a 5.5. Early Snow from the Winnipeg Art Gallery although darker in value overall with a 5 in the sun and 7 in the shadows still reads believably as a snowy winter scene. Probably a textbook example of values for snow is in Thomson’s Woods in Winter with a value 3 for snow in the sun and a drop of 3 to a 6 in the shadows. 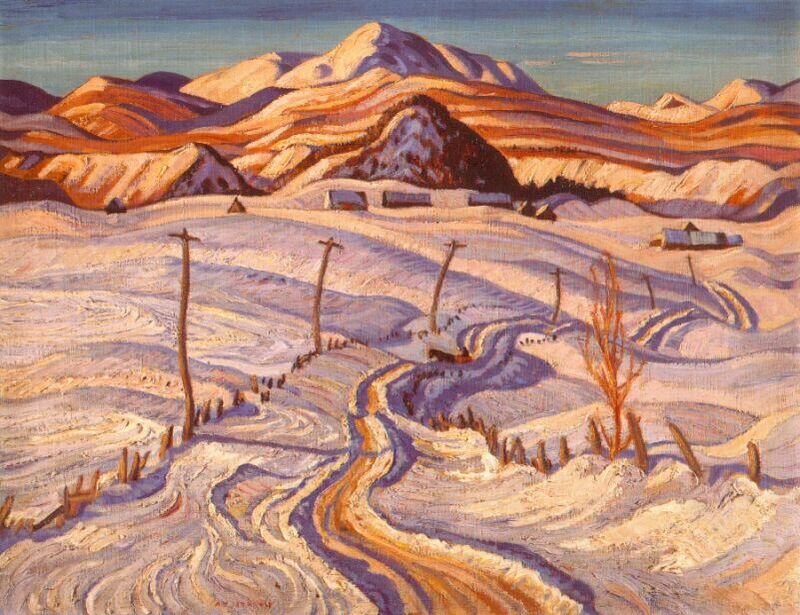 The painting that I observed the biggest difference between sun and shade values was Path Behind Mowat Lodge with a difference of 5 – from a 3 in the sunlit area to an 8 in the blue/purple shadows cast upon the snow. So what did I learn from my little study? Snow in the sun should be depicted with a value of around a 2 to 4 and the shadow on the snow are about 2 to 3 points lower (darker). This generally mean a value between 5 and 7. Of course my little investigation is not highly scientific. 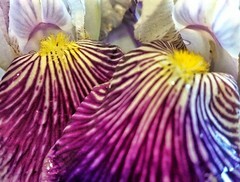 I was just working off prints in books (Incidentally Tom Thomson, edited by Dennis Reid is a good one, full of images ). I think that maybe if I could measure the value with scientific instruments directly off the original paintings then I could know the secret – but then again I think it probably wouldn’t make that much difference and having a formula, or specific numerical values certainly isn’t going to allow one to recreate the magic of a Tom Thomson painting. 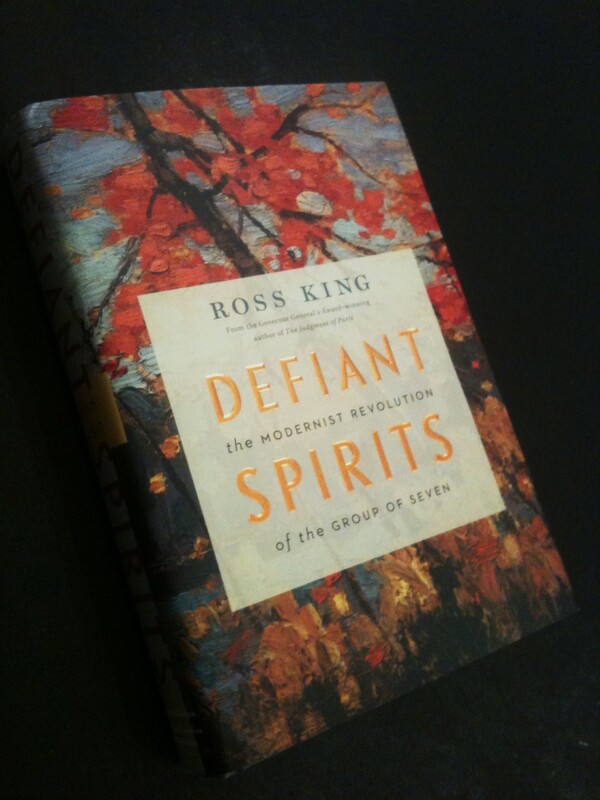 I have just finished reading DEFIANT SPIRITS, The Modernist Revolution of the Group of Seven by Ross King. It was a very enjoyable and informative read. King traces the formation of the great, now quintessential Canadian art movement, tying together the characters and the history of the time. Although I was generally familiar with the Group of Seven, there were two fundamental lessons that had never really clicked into place for me before reading this book. The first was the influence of the First World War and secondly the struggle by the Group for acceptance of their art by critics and the public. The First World War (The Great War) was very important to Canada’s development as an independent and influential nation on the world stage. I had heard this fact before but King makes it all so clear from the pressure at home to enlist, to the adventures and horrors experienced by members of the future group who fought in the trenches and served as war artists. A significant part of the book is set in Britain providing interesting insights into not only to the Group of Seven and painting, but also to the war effort and military structure. It seems so hard for me to believe that the style of the Group of Seven met with such resistance in their time. Their art was decried by many critics and the public as radical, revolutionary and just poor art. The artists felt strong in their commitment to develop a distinctive, modern Canadian style of painting. They benefited from limited but critical support from two people. First was Dr. MacCallum who provided financial support that allowed key members to concentrate on their art and importantly to stay in Canada, so that their collective influences could ignite the movement. Second was the support of the National Gallery and particularly director Eric Brown and Sir Edmund Walker under whose guidance paintings of the group were purchased (not without criticism and controversy). The strong moral support (and of course the money) from this national institution obviously gave the Group members confidence to carry on with their struggle. Another aspect of this book (in fact the one that first piqued my interest) was regarding the possible influences of the European art movements of the time upon the Group of Seven members. I have been a long time fan of the the Impressionist and Post-impressionist movements in France and curious if there were any connections with the Canadian landscape painting school. In Defiant Spirits, King does explain a number of connecting threads, such as which of the Canadians studied in Europe or otherwise came into contact with European art movements of the time. The book also paints a clear picture of the relation between Tom Thomson and the Group of Seven. I have long believed the supposition that Thomson, had he not died, would surely had been a member of the group, once if formally formed. This book presents so many examples of Thomson interactions with and influence upon the future members of the group (for example sharing studios and travels) that there can be no doubt. Defiant Spirits is divided into three “books” and each book has a section with color plates of some of the paintings that are discussed. The book also features numerous black and white photos, particularly of the characters. The book seems to be very well researched (with an extensive bibliography) and definitely is well presented. It is a great story. I don’t hesitate to recommend it to anyone who is interested in the Group of Seven and this period of Canadian history. In my last post I spoke about how few of my landscape paintings are of snowy scenes. In this post I share what I aspire to – some of my favorite Canadian landscape paintings featuring snow. Lawren Harris, one of the key members of the Group of Seven had snow in a number of his landscapes. Often this snow would be capping distant mountains but in Snow II it is in the foreground, heavily laden on evergreen boughs. A key observation illustrated by this painting is that snow doesn’t have to be white and certainly not when it is in the shadows. Shacks, a 1919 painting by Harris shows whiter sunlit snow on the ground and roof tops of an urban scene. 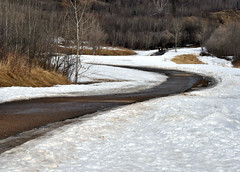 Note though the color and value difference of the little bits of snow falling in shadows. The Drive is a masterful example of depicting sunlight and shadow on the snow. The difference is pretty subtle but to me it read instantaneously. As a final Harris example North Shore, Baffin Island show the snow/ice atop distant mountains. Again the lesson for me was the value and color difference between the shaded and sunlit snow. I looked at reproductions of a number of Group of Seven paintings and used a value scale reference card to assess the value of snow in sun and shadow. I think in terms of a nine-point value scale with 1 being white and 9 being black. I observed that there was typically a 3 point value difference between the snow in sun and shadow – commonly a value 3 in the sun and a value 6 in the shadow. Finally a couple of examples of snow paintings from a couple of other members of the Group of Seven: A.J. Casson’s Winter on the Don and J.E.H. MacDonald’s Early Evening Winter (a great example that an area doesn’t have to be white to read as snow). 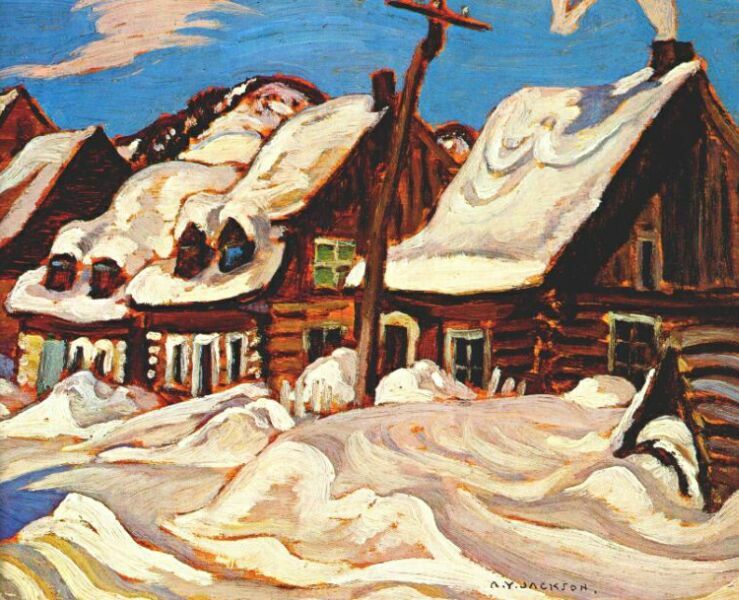 There are of course many, many other examples of snowy landscape paintings from the Canadian Group of Seven and if you explore the links given above you will come across other great examples. In a future blog I will share some of my favorite Tom Thomson snow paintings. Although I am developing quite a stack of art-related books to read, my most recent acquisition has jumped to front of the queue! I am now through the first four chapters of “Defiant Spirits, the Modernist Revolution of the Group of Seven” by Ross King – and I am loving this book. I have been eagerly anticipating this book since I first heard (last winter) that it was coming . As soon as I saw orders were being taken, I put mine in. So why my interest? Firstly I am a big fan of the quintessential Canadian art movement, the Group of Seven (and of course Tom Thomson) and that is who this books is about. I am eager to understand all I can about how these painters came to see and paint the Canadian landscape the way they did and this book is certainly aiming to do that. The other great personal influence for my painting was the impressionist and post-impressionists movements. This book attempts to explain ties between the European and Canadian movements, looking at the history of each of the members of the group, their European influences and their interactions with each other. Much has been written (and much I have read) before about the Group of Seven but I am learning new things with each page of this book.